2008: Norwich Christian homeless project leader Chris Callaghan (right) has completed a five km run in a personal best time only months after suffering a heart attack. "The run went really well," said Chris. Despite the hot sun I achieved a personal best. I want to thank everyone for their support. It is amazing from where I was last September. To God be the Glory!" 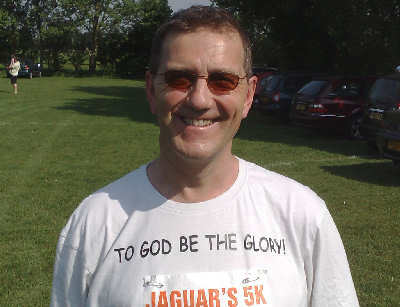 Chris ran to raise cash for a charity which is supported by his church, Grace Christian Fellowship on Mile Cross Lane, Norwich. It is called Hope Community Trust and supports a children's orphanage and school as well as a Bible school in a remote part of India called Andhra Pradesh. Project India UK is a Christian organization which helps support the poor in Andhra Pradesh and the project is run by Pastor Zion Samuel of Viskhapatnam and is part of registered UK charity Hope Community Trust. Project India UK works with some of the poorest people in India, who have no support from any area and rely on charitable donations. To read more about the charity on this website, click here. You can do it Chris, Praise the Lord for renewing your strength. Dear Chris I am so thankful you have full recovery. I praise God for you and your lovely family. Your love and commitment to those who need Love and understanding is outstanding. We continue to be awe of God's favour. well done chris thats a fantastic result. you have certaintly come a long way from when we first met, proud of you. God bless you dear brother,it was great to witness the grace and mercy of christ through norwich union and god's name will be glorified and we have seen such a great recovery in you from heart attack and we will pray for you and for your work. once again thank you for the money towards children in inida.